Under the terms of a February 20 agreement with creditors, Greece is being asked to pay its own way through March and April, while 7.2bn euros in loan instalments are withheld until May. Without financial assistance, Greece could default, even if by accident. The government has said it will prioritise IMF payments, but it is thought to need at least 4bn euros to prevent a credit event with private lenders. It has asked pension funds to lend it an estimated 2.5bn euros in their accounts, but they have so far refused. One possible source of money is to allow the government to issue short-term bonds. The European Central Bank refused this last month, because the only people buying Greek debt right now are Greek banks, who are doing it on money borrowed from the ECB. A bond issue would therefore be a back-door ECB loan. Another possible source of money would be giving the Greeks the 1.9bn euro profit the ECB made in 2012 by buying Greek bonds at low rates from other lenders. Even if all goes well and Greece gets the whole outstanding 7.2bn euros by May, it faces a funding shortfall of at least half a billion euros before the end of the year. Three measures may help address that; the first is a tax bill coming to discussion in parliament in the next few days, which is expected to encourage large down payments from taxpayers in arrears. The second is an initiative to collect 2.5bn euros from wealthy taxpayers who seem to have mis-declared their income. The third is an initiative to redirect the proceeds of the Asset Development Fund, which oversees privatisations, to social security and away from overseas creditors. Such a move is likely to annoy the latter, but might finally guarantee the solvency of the former. Greeks are just as worried as their creditors during this hiatus between the Feb. 20 agreement and legislation backing it up. The Athens stock market continues to fall, and some 20bn euros lifted from bank deposits before and since the election have not returned. Greece's famously atheist prime minister, Alexis Tsipras, on March 10 used a religious metaphor for the first time in his career. Re-launching a dormant parliamentary committee into German war reparations, he said, "I've heard a lot of provocative statements from abroad in recent days, which puts me in mind of a famous quotation from the Sermon on the Mount - 'They see the blemish in their brother's eye, but not the log in their own eye.'" He spelled out the relevance: "Just as we commit to seeing through our obligations, all parties are obliged to do the same. Morality cannot be a la carte." During the occupation of Greece, the Nazis extracted two loans from its central bank. Those loans, which some estimate to be worth 15bn euros today, have never been repaid and constitute Greece's strongest suit in the reparations debate. There has indeed been a lot of sermonising directed at Greece since the January election, particularly from European leaders. Holding Germany to wartime reparations is perhaps the only opportunity Greece has to reciprocate; but it did not do so until well after a February 20 Eurogroup meeting, where it was railroaded into accepting a four-month extension of the bailout agreement, along with austerity commitments. The present leftwing government had vowed not to carry on the policies of austerity. It asked its institutional creditors, instead, for a 'bridge' period of continued financing without austerity targets. The government would use this time to negotiate a post-2015 regime: Greece would repay its debt in full, but over, say, 30 years rather than 17. It would commit 1.5 percent of its GDP a year, rather than the hitherto agreed 3 percent, enabling it to finance an economic recovery and alleviate a humanitarian crisis at home. Yet what the government came away with after three bruising conferences with Eurozone countries is a bridge of a different nature - not financing without austerity, but austerity without financing. Greece has until the end of April to show that it is serious about restarting the economy and repaying its debt. Until then, financial assistance is being withheld, but Greece still has to repay debt as it matures. For March alone, this means that some six billion euros in cash from pension funds, public companies and European infrastructure and farming subsidies have to be collected at the Bank of Greece to repay creditors. Needless to say, this further weakens the Greek economy in the short term. Germany played a key role in this about-turn. On February 16, it sidelined the European Commission, which had been prepared to give Athens the benefit of the doubt, and effectively told Greece that it could either pick up where previous governments had left off, or jump off a cliff. Tsipras' and Varoufakis' threat last weekend to hold a referendum or another election suggest the extent to which the Greek-German relationship has unravelled. It also suggests that Greek public opinion is being prepared for all eventualities. Much of this standoff has been political posturing. Greece's ruling Radical Left Coalition party, or Syriza, undoubtedly offended with its talk of upending the "dead-end austerity policies" Germany has godfathered in Europe's weaker economies. Greek finance minister Yanis Varoufakis has described austerity policy as a sweater that will unravel in Portugal, Spain and Italy if only the thread can be found in Greece. But Germany's heavy-handed treatment of Greece has now added further political costs to keeping that sweater whole. Should the European Union's most dominant member effectively determine who gets to stay in the single currency and under what terms? Is it right for it to sideline the European executive and be seen to do so? Is the euro still pushing the European confederation towards federalism, or driving it apart? And how does one balance national sovereignty with regional solidarity in a period of righteous indignation on many sides? These questions may not sit at the top of the agenda now. Attention is for the moment focused on whether Greece will default, causing a state of emergency in the Eurozone; but they will surely bedevil the Eurozone in years to come. France's National Front leader, Marine Le Pen, who leads both the president and the parliamentary majority in polls, is already advocating a voluntary departure from the euro. For now, Greece's relationship with the rest of Europe has reverted to what we have been used to seeing in the past five years: technical teams of experts talking over points of policy and public expenditure. Sixty-nine percent of Greeks still want a compromise, according to a recent poll in the government-friendly EfSyn newspaper. But Syriza has pitted people power against the power of money. If anecdotal evidence is any guide, its humiliation has made the prospect of a Greek default a few notches more politically acceptable to Greeks. The Greek government says it is satisfied with a political-level agreement at Monday's Eurogroup meeting. Though the single currency bloc's finance ministers only discussed Greece for 20 minutes, Athens is hailing this as a first step towards implementing a Feb. 20 framework agreement that aims to bring Greece back to fiscal health and normalise its relations with creditors. However, Monday's Eurogroup statement did not even mention Greece, suggesting that creditors have not yet committed to any of the measures. 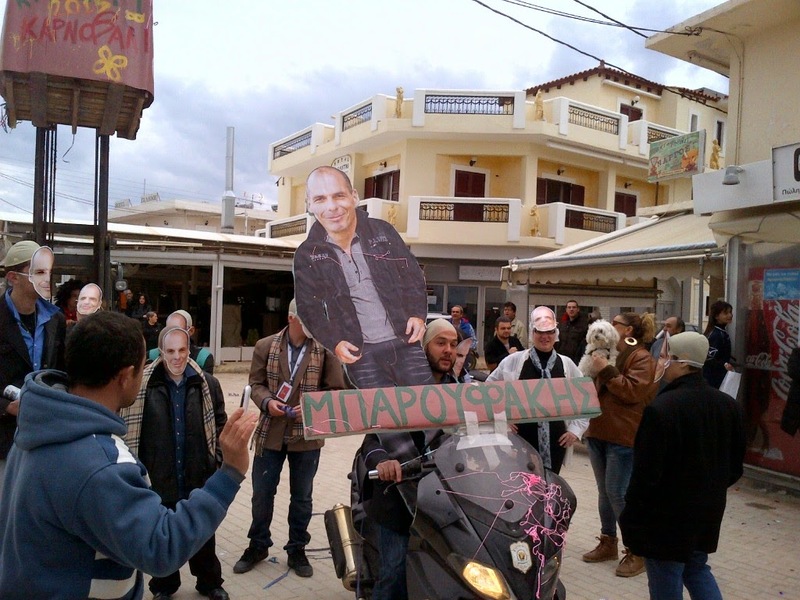 Revellers at this year's Apokries (carnival) parade on the island of Angistri, southwest of Athens, dressed up as finance minister Yanis Varoufakis. He has achieved both fame and notoriety through his flamboyant style and media exposure. Monday's Eurogroup was the fourth of his six-week tenure, and the only one so far not to end in either a rupture or a controversial compromise. Technical teams are to carry the discussion forward on Wednesday. These will meet in Brussels, as Athens wants to avoid the reappearance of inspectors of the the so-called troika of creditors - the European Union and Central Bank, and the International Monetary Fund. Those inspectors had given Greece the appearance, as well as the reality, of a debt colony, the government has said. In what the opposition is likely to seize upon as a major concession, Eurogroup chairman Jeroen Dijsselbloem revealed that inspection teams would also be arriving in Athens. However the government has not agreed to this, and will not officially comment on Dijsselbloem's remarks. Government spokesman Gavriil Sakellaridis re-iterated on Tuesday that inspectors will not set foot in Athens. If Dijsselbloem is borne out by events, that would be the second concession forced upon the leftwing government in Athens, after it accepted an extension of the austerity programme rather than risk losing all financial backing. The government plans to prioritise six measures from among a slate of reforms it proposed on February 23. It hopes in this way to win the trust of its voters and creditors alike. Its aim at home is to come through on election promises, and to appear to do so. Its aim abroad is to secure the release of 7.2 billion euros in loan instalments. Those have been frozen until May, but the government needs them to pay debt due this month. 1. The implementation of a Fiscal Council, which will advise the government on drafting annual budgets and carry out long-term economic planning. This, premier Alexis Tsipras told Der Spiegel, will prevent him or any other prime minister from spending their way back to primary deficits. 2. Amending the Organic Budget Law, so that ministries over- rather than under-estimate their expenditures for the coming year. This would help ensure that spending is within forecasts. Greece actually managed to keep its expenditure under forecast for 2013 and 2014, the two years in which it produced primary surpluses. 3. A flexible body of laypeople who will catch out retailers who don’t issue receipts. This is the most fanciful of the proposals, and seems likely to be replaced by a last-minute addendum – a VAT lottery to reward people who submit retail receipts. The aim is still the same – to maximize income from VAT, which makes up a huge proportion of the public revenue. Last year it accounted for 13.6 billion euros, from a total of 44.2 billion euros in tax revenue. Compare this to a mere 2.7bn euros raised from corporate tax, and 7.8bn euros raised through personal income tax, because the number of working people has fallen during the crisis to a mere 3.5 million. 4. A new incentive for taxpayers to clear their arrears. The government will forgive all fines and interest on tax and social security arrears, if debtors come forward with a sum of equal size, and agree to pay off the balance in an instalment scheme. Alternate finance minister Nadia Valavani presented details of the scheme on February 18, and clarified them last week. This bill is expected to go to parliament this month. A last-minute addition would provide a similar incentive to high net worth tax-evaders to pay up. The government has reviewed the income tax declarations of people with more than 200,000 euros in the bank and found a discrepancy of roughly 7bn euros. It believes it can collect 2.5-3bn euros in taxes from them, especially by providing them with a carrot of amnesty from interest and fines on amounts, and a stick of property repossession. 5. A clampdown on online gaming. The government believes it can make another 500 million euros a year on what it estimates to be a 3bn euro industry. The government has other plans for clamping down on large-scale tax evasion, for instance in the fuel haulage business, estimating benefits of up to 1.5bn euros for the treasury. While that legislation remains in the works, the government says it will clamp down on a particular type of corporate tax evasion - the understatement of the value of imported goods through fraudulent invoicing. 6. Streamlining the public sector. This is a mammoth task, but the government wants to begin by enforcing a simple rule - that no branch of the state will ask voters to fetch documents it can find in another branch. Such internal communication could save the private sector untold man hours. 7. Humanitarian relief. This is not strictly a reform, but it is a top government priority, and its inclusion in the first clutch of legislation is a political imperative. A bill to subsidise food, housing and electricity for the destitute was the first to be submitted to parliament by this government on March 3. This article was published by Al Jazeera International under the title 'Greece: Climbing out of debilitating private debt'. The Bay of Eleusis, half an hour west of Athens, was once a powerhouse of the Greek economy. Smokestacks, concrete kilns and dry docks now tower like grave markers to a great experiment in heavy industry that started here in the 1950s and began to fizzle out in the 1980s. On the western edge of the bay, however, the rhythmic hole punching and bending of sheet metal can still be heard. Here, the Liritis Rolling Door factory is fighting the Greek recession tooth and nail. Its owner, Dimitris Liritis, has seen all his neighbours fall to a plague of debt. “For all of 2012, trucks drove out of here carrying machinery – decades’ worth of investments,” he says with a look of bewilderment. “Do you know what they sold them for? Scrap”. Liritis ought to be retiring comfortably by now. His clients include the armed forces, the 2004 Athens Olympics and the new Athens airport. Instead, he is fighting to stop banks from repossessing the business he inherited from his father, and spent his life expanding. “It was then a small workshop. Now it covers a hectare, and banks played a role in that. But suddenly we are back to where we started, and we’re all alone,” he says. Liritis owes banks $9mn, because the rolling door business has fallen to less than a tenth of its pre-crisis turnover; and since real-estate prices collapsed, his factory is no longer sufficient collateral. His debt is a small bit of the estimated 80bn euros Greeks owe banks. Debts to the state are even worse - 20bn euros in social security contributions and 76bn euros in tax arrears. Finance minister Yanis Varoufakis called this “a major impediment to recovery” in a February 16 letter to his colleagues in the single currency bloc. In fact, Greek private debt is equal to the 170bn euros in emergency money Greece has so far borrowed from its European Union partners and the International Monetary Fund. Settling it quickly would enable Greece to solve a liquidity crunch between now and April, which is the earliest its creditors may release 7.2bn euros in aid instalments. In an effort to save his father’s business, Liritis helped found Ypervasi – a civic action group whose name means “overcoming”. Its strategy is ingeniously simple: “Instead of sitting on the sofa, waiting for a court bailiff to throw us out of our homes, we’ve launched class action suits demanding a haircut to our loans,” says Ypervasi’s director, Kyriakos Tombras. Ypervasi now represents 20,000 people with two billion euros in bank debt, and it’s still growing. Tombras doesn’t know what his chances of success in court will be, but he thinks that’s besides the point. While bad bank debt has been building for many years, two thirds of tax arrears date to just the past five years, when austerity governments piled on new taxes to boost revenue. They are still growing at a rate of a billion euros a month. Last October, the conservative-led coalition defied the country’s creditors by allowing people to pay their deferred taxes in up to 100 instalments, but that only brought a fraction of the arrears into the scheme. Greece’s new, leftwing government has now suggested broadening the scheme. It wants to include small debtors (under 5,000 euros) who comprise the overwhelming majority; and it wants to include debtors of over a million euros, because 97 percent of the debt is owed by just 11 percent of debtors. Alternate finance minister Nadia Valavani also wants to collect a large, up-front sum to show creditors that Greece is serious about revenue. She would like to entice people to come forward with a down payment, offering to match it with a discount. The remaining balance would go into the instalment scheme. Having offered this carrot to those who are able and willing to pay, Valavani would be left with those who are unable, whose debt would be frozen, and those who are unwilling, who would be punished. “For people who refuse to enter the instalment plan and by income are able to, there will be no mercy,” she said on February 18. Valavani revealed that the “effective receivable amount”, which excludes bankrupt companies, state enterprises, debtors with bank claims on them and debt in litigation, is just nine billion euros. Similarly, markets suggest that the mountain of bank debt is only worth pennies to the euro. If only a fraction of Greek private debt can be reclaimed, what does this suggest about Greece’s ability to repay its public debt? Over the longer term, Syriza has pledged to meet Greece’s obligations in full, but wants to limit the portion of the economy that is spent on repayment to 1.5 percent – a third of what creditors have stipulated, so that some wealth is left over for reinvestment. In the short term, however, the state continues to make indiscriminate demands. Just how indiscriminate is apparent from SOS Children’s Villages, a foster care charity. During the crisis, it has taken in 50 percent more children and sends shipments of food to thousands more families; yet its taxes have tripled. Despite its charitable status, it loses almost half of what it earns in fundraising drives and from interest on deposits; and far from seeking a state subsidy, it brings in money from overseas donors to supplement donations at home.